When looking at the US Dollar Index (USDX), I was surprised to notice a sudden pullback on Thursday afternoon. It turned out that the markets reacted unfavorably to the news that continuous jobless claims increased to just over 350,000 last week. This created fears that the Federal Reserve would use this data to deter away from tapering Quantitative Easing (QE) during this Wednesday’s Federal Open Market Committee (FOMC) meeting. In truth, Thursday’s pullback was a market overreaction. The USDX will look to retrace these losses over the upcoming days, with key US economic data being released into the mainstream. Firstly, it is highly likely that the Federal Reserve will taper QE this Wednesday. Initial jobless claims have shown considerable improvement over the past couple of months, consistently scoring under the 330,000 benchmark since November. In fact, if initial jobless claims had scored over 350,000 last week, then I would understand the USDX pullback. Equally, there is valid evidence to support the assertion that the US employment economy is showing substantial progress. For the past two months, the Non-Farm Payroll’s (NFP) have surpassed expectations. It is true that January’s NFP was disappointing, however the hazardous weather conditions the US encountered over Christmas would have most likely affected data collection, questioning its validity. 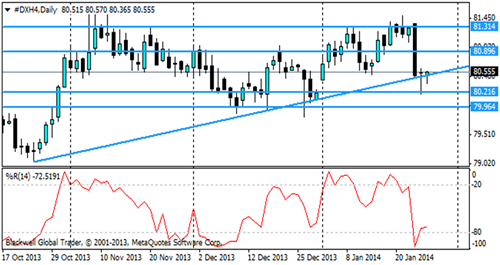 The likely QE taper on Wednesday will prove bullish for the USDX. Additionally, Bloomberg is reporting that the previous quarter reflected the strongest levels of US consumer expenditure in over three years. This would suggest that Tuesday’s Consumer Confidence reading should indicate growth. Likewise, it is also expected that Thursday’s Gross Domestic Product (GDP) 4th quarter release will show that the US economy was not as badly reprehended by October’s famous government shut down, as first feared. Confirmation of this will further elevate the USDX. Regarding the technicals, I can see that the USDX has recently approached the trend line, with further support levels at 80.216 and 79.964. I can see one resistance level at 80.896 and a major resistance level at 81.314. According to the William’s Percent Range, the USDX recently breached the oversold boundaries and could now be looking to progress upwards. Overall, with such a high altitude of US economic data being released this week, starting with Tuesday’s Consumer Confidence, before Wednesday’s highly anticipated QE decision and Thursdays GDP 4th quarter release, the USDX could be in for an aggressive movement over the next couple of days.